For those who prefer the softer and rustic appeal of timber as opposed to steel, we also sell a range of quality, pre-assembled timber sheds in a variety of sizes. 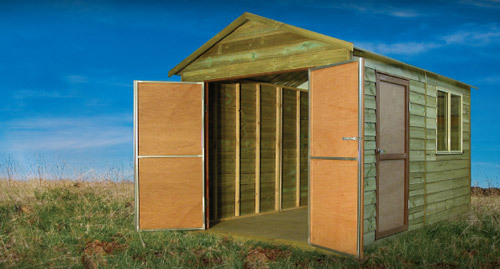 Each timber shed is made to order, and you are able to choose from a range of door and window options and positions. Roofs are available in any colour and skylights can be added to permit natural lighting. All our timber sheds include flooring and bearers. There's also an option to include an additional sub-floor as an optional extra, which could be helpful in raising your shed or cope with a sloping site. Storage of tools, paints, lawnmower, etc. As well as our timber sheds - often used as wooden garden sheds - we sell Geelong cubbies and forts and steel frame sheds for Melbourne, Hoppers Crossing and Werribee.